By Nicole Leach, Esq., who is a lawyer and former UCLA track star. In 2006, while a student-athlete at UCLA, Leach earned gold on the World Junior 4×400 relay team in Beijing. In 2007 she was the NCAA 400m hurdle champion and represented the US at the World Championships and earned two bronze medals at the Pan Am Games. She was an Olympic Trials qualifier in 2008 and NCAA champion again in 2009. She most recently competed in the Olympic Trials in 2016 and will soon move into legal practice in Philadelphia. Shaunae Miller’s diving finish to beat Allyson Felix in the women’s 400m final and the US women’s 4x100m re-run have left the public perception of track and field unsound. People have taken to social media and other outlets to label Miller as a “cheater,” Felix as having “settled” and that the US 4x100m relay received “special treatment.” An amateur fan of track and field would likely conclude that the rules of the sport are being made up on the fly. However, Miller, Felix and all individuals involved in the 4x100m re-run have all acted well within their rights under the International Association of Athletics Federations (IAAF) Competition Rules 2016-2017 (IAAF Rules). But why is it that these athletes are taking such a hit from the world? Why do the outcomes of these recent events feel unfair to most? The most likely answer is that the rules of track and field are foreign to Olympic viewers. The sport only gets global attention every four years; thus, customary occurrence such as dives and protest seem random and unfair to the seasonal Olympic fan. The world does not know or understand the rules behind the sport. Below is a break down of the rules and traditional philosophies that shed some light on why the recent “random” outcomes are not random at all. Women’s 400m Final Recap: In the last few meters of the race Shaunae Miller (BAH) “dove” for the line to beat Allyson Felix (USA) for the gold medal. The result of this race was a battle of two age-old philosophies: run through the line vs. lean (or dive) for the line. There are no rules preventing leaning, diving or even flipping at the finish line. In addition, IAAF Rule 164.2 states that athletes are to be placed according to whose torso reaches the vertical plane of the finish line first. Thus, the philosophy to dive at the line is not only allowed, but is highly efficient once an athlete is within a torso length from the finish line. However, diving and leaning takes extra energy, thought, proper timing and can slow you down if done too early. It takes a lot of skill to get it right and it does not always work, which is why running through the line is the typical and more promising strategy. Yet in any given race, either strategy may prevail over the other. It just so happen that this past Monday, in the women’s 400m final, the dive was more efficient. No one cheated, no one settled, and the Referee properly set the results according to the person whose torso was across the line first. 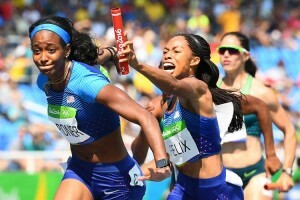 Women’s 4x100m Semi-Final Recap: As Allyson Felix (USA), entered the second exchange zone to handoff the baton to English Gardner (USA), from the neighboring lane Kauiza Venancio (BRA), made contact with Felix, which inevitably caused Felix to drop the baton while passing to Gardner. The Brazilians were disqualified (DQ’ed) and the US was allowed to re-run the race alone to post a top-eight time worthy to compete in the finals. The US successfully ran a top-eight time and China, who had the eighth fastest time prior to the re-run, does not advance to Friday’s final. Social media has had a lot to say about this event. Some think it was wrong to DQ Brazil since Venancio’s contact was unintentional. 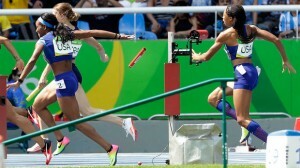 Others find the DQ just, but believe the US re-run was unfair to China who had no part in the baton falling. Also, a small few believe the US should be DQ’ed for dropping the baton. Either way, a large consensus has an issue with the outcome. IAAF Rules state that if an athlete is obstructed during an event so as to impede his progress, the athlete responsible for the obstruction shall be disqualified from that event. If the Referee deems that the obstructed athlete was “seriously affected” then he “may” re-hold the race excluding the DQ’ed team or allow the affected team to compete in a subsequent round. The “seriously affected” athlete or team is expected to have completed the event. Tradition has shown that the most optimal way to pass a baton while running full speed is to have the incoming and outgoing runners along opposite sides of the lane. To ensure a quicker route around the track runners on the curve run closer to the inside of the lane while the runners on the straight run closer to the outside. Because each leg holds the baton in the opposite hand, this formula allows a direct pass that decreases the chances of dropping the baton. However, if a baton is dropped, IAAF Rules state that the athlete who dropped the baton shall recover it in a way that does not lessen their distance in the race or impede another runner. If recovered accordingly then a dropped baton is not a DQ. Lastly, protest under IAAF Rules, concerning the result or conduct of an event shall be made within 30 minutes after the release of the official results. Given these rules, the actions taken by Venancio, Felix, Gardner, Morolake Akinosun and the Meet Referee are all permissible. Venancio was starting along the inside of lane 3 to ensure a more efficient pass, while Felix ran closer to the outer part of lane 2 to ensure efficiency as well. Thus, it was a coincidence that Venancio would be taking off as Felix was approaching and without the contact to Felix, Brazil likely would not have been DQ’ed. Unfortunately, IAAF Rules do not require that Venancio’s contact be intentional, but that she is only responsible for obstructing Felix. The Referee decides whether the obstruction seriously affected the US 4x100m relay team. Felix, who dropped the baton, recovered the baton so that Gardner, and Akinosun could run their respective legs allowing the US to complete the race, but much slower than expected. A protest within the 30-minute time frame leaves all remaining decisions at the discretion of the Referee. The rules allow the Referee to either re-hold the race with everyone except Brazil or to automatically place the US in the final without considering China. However, a complete re-run could have changed the results more than need be, allowing not only the US a second chance, but possibly another country as well. An automatic advancement of the US would be completely unfair to China, since there was no actual proof that the US would have completed the original race successfully, without the mishap. While both flawed options are allowable, the Referee, understanding the impact of his decision took further steps and created a unique option to seek optimal fairness. The Referee’s choice to allow the US to earn a lane in the final, obstruction-free like China, is permissible and reasonable. Brazil’s incidental contact is a clear disqualification under the rules. The US performed by the book to win the protest and the Referee’s decision to hold a solo re-run provides support that the US deserves a lane in the final over China. While this week appeared controversial to intermittent fans, it was actually a respectable week of well-run track and filed events. Miller thought to dive under fatigue while Felix believed her speed was enough to carry her through line first. Venancio had no intention to hit Felix, the US was right to protest the contact and not only did the referee exercise proper discretion, but he made sure the eight finalist in tonight’s final belong in the final. While it may seem like the rules are being made up on a day-to-day basis, the sport is actually operating in a very fair and legal manner. This entry was posted in Articles and tagged Felix, Gardner, Olympics, sportslaw, track. Bookmark the permalink.